A couple weeks ago, while I was combing my computer files and selecting material to present here, I was suddenly struck by the thought of how widely spread geographically were the layouts on file, as well as how varied were the approaches to modeling. And I conceived the idea of trying to assemble a collection of contributed layouts from many different countries that would represent most of the various types of minimum-space lines being constructed across the world today. And I could present it in December, the season in many cultures dedicated to peace on earth and good will toward all men. This page is the result. 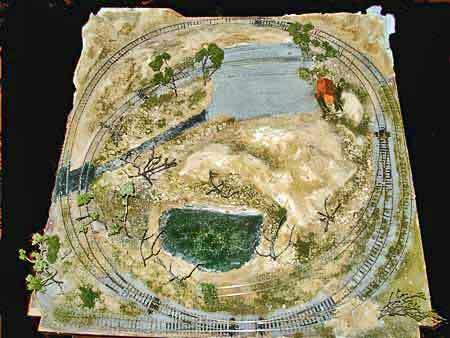 All the major scales are represented, from N to G. Both standard gauge and narrow gauge are here. Operating schemes vary from round-and-round running to intricate switching tasks. The builders of each layout shown are all from different countries, yet I was struck by how many of them are modeling railroads of countries outside their own! I don’t know how representative this international collection is, but it certainly presents a vivid cross-section of modeling being done currently around the world. The layouts are presented alphabetically by country of origin, and I hope you enjoy reading about them as much as I enjoyed assembling them. 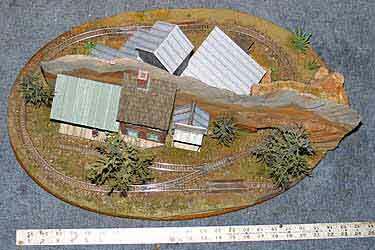 James Stanford, from Nowra, New South Wales, wins this month’s prize for cramming the most track into the smallest area. 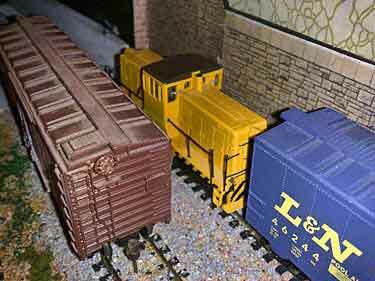 HO-scale Case Industrial fills a 2x1ft (60x30cm) suitcase. Believe it or not, there are sector plates in all three buildings, each holding a loco (like a GE 44-tonner) and a 40ft car. 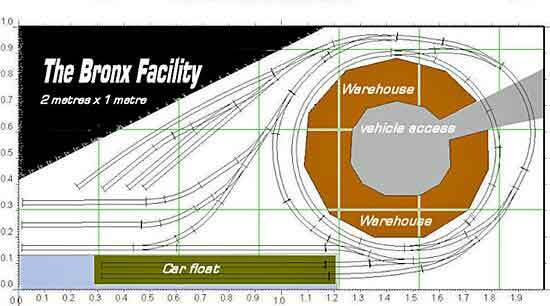 There’s a single-car runaround loop between the two front buildings, so just one loco is needed to swap cars at the three industries. 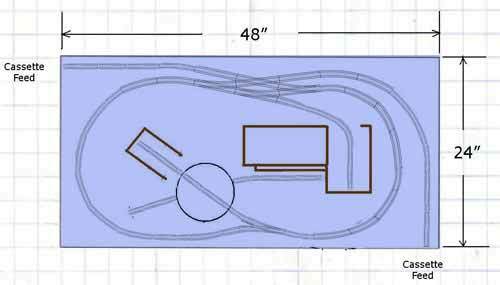 To start a session, incoming cars are spotted on the yard tracks; departing cars are dropped there at the end. 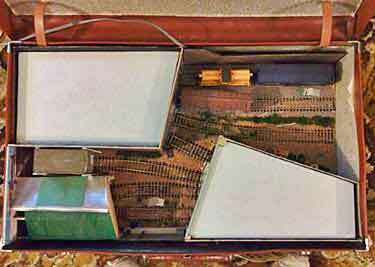 Sector plates are operated from the layout’s edge using push-pull wires. For more info, see this website. Brian Wilson, from Victoria, British Columbia, is building his fourth (or is it fifth?) minimum-space layout, this time in Gn15 scale. Says Brian, “There are two basic switching operations: (1) Incoming raw materials from the lower right cassette are switched to the processing plant and empties are returned; and (2) Empty cars are brought in from the left upper cassette, run around to the turntable and shunted to the plant’s loading dock. Full cars are returned.” Two locos will be required. We’ll keep you posted on his progress! 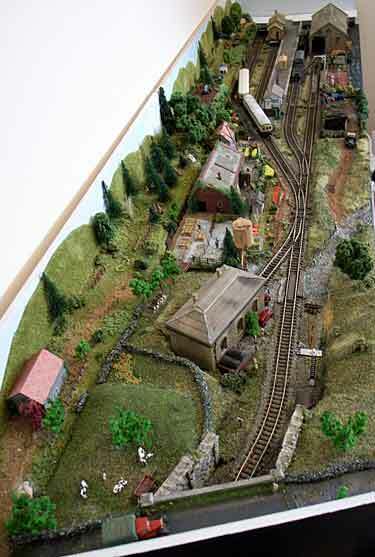 David Mitchell, from Reading, felt the need of a continuous-circuit “test track” for his N scale locomotives, given that his other N-scale layouts are linear affairs (see Kidmore Gumstump). David explains, “I unashamedly copied a 1990’s design and rather than having a bare board decided that a scenic finish could be accommodated using mainly parts from the ‘spares box’. 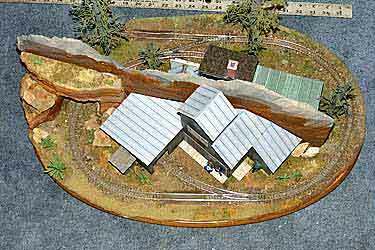 “Constructed with little more track than supplied with a proprietary train set, Kidmore Magna measures just 30x24in (76x61cm) with a scenic section of just 18 (at max)x24in. 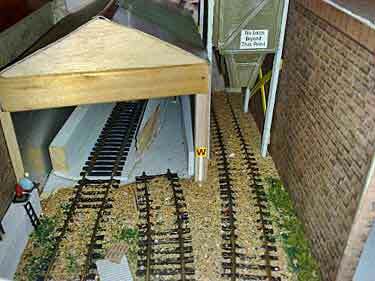 Hopefully it demonstrates that a successful model railway can be built in the smallest space and with minimal expense!” For more information, see David’s website. 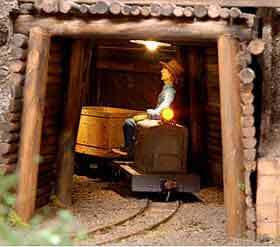 Dirk Becker, from Aschersleben, Saxony-Anhalt, built Slate Creek Mining to represent a hard-working industrial narrow-gauge line in the Rocky Mountains of Western Canada. The Gn15 layout measures 90x60cm (3x2ft). The gold-mine tunnel mouth shown is not the mine’s adit but rather the entrance to the air and supplies gallery, which is served by the little narrow-gauge railway. 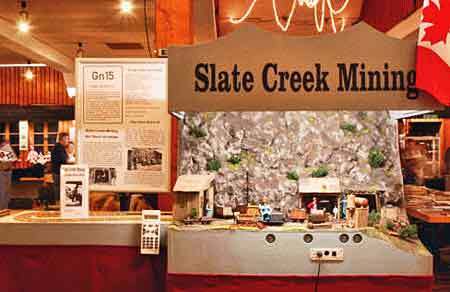 Slate Creek Mining has a very unusual fiddle yard (lower right). 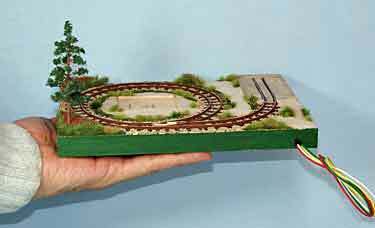 Instead of being hidden away, it is in plain sight (where most viewers would like it to be) and completes a looped circuit of track. 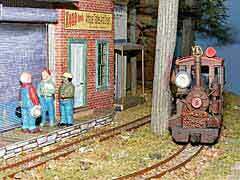 Thus, an operator can set a train in motion and ignore it while he chats with the viewers. 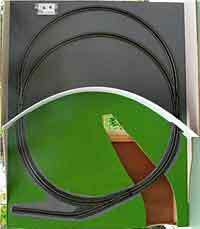 The single exposed side track is primarily for programming DCC. For more information and photographs, see Dirk’s website. Francesco Zezza, from Rome, modeled his latest N-scale layout, Nowhere Junction, in the Western United States, because he wanted a home for his elegant model of the Big Boy—the giant articulated locomotive of the Union Pacific. 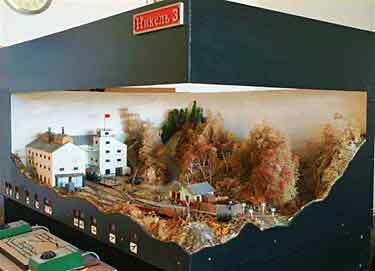 He planned the layout as his impression of the “Sherman Hills of Calfornia” and built it in 125x52cm (49×20.5in) on a pull-out shelf under his computer desk. It’s his first attempt at modeling a U.S. prototype. In the event, the curves are somewhat too tight for the Big Boy to traverse easily, so it is limited to “rail fan passes” hauling a string of boxcars and a caboose. Francesco explains, “That’s why I switched to diesel locos (preferring those with four axles such us the GP40/50 that ‘go around’ better) for actual train running.” The layout itself is a simple oval plus an interchange track, a team track leading to a small industry, and a small yard raised slightly to hide a “dummy station” at the rear, where through trains can hide while switching is going on up front. 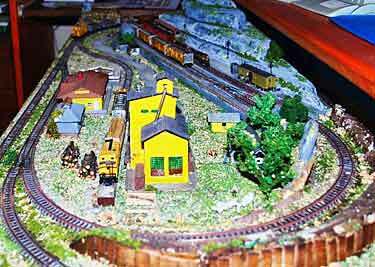 Yutaka Nakai (nicknamed Yuta), from Kyoto, sent photos of his tiny N-scale micro layout, KISEKAE, which features changable scenery that quickly converts the layout from a Japanese scene to an American one, and back again. The tiny setting measures 210x148mm (8¼x6in). 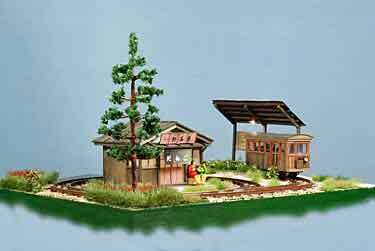 The American scene features a country road-house (“Susie’s Bar,” Yuta’s favorite), while the Japanese scene has a rural passenger platform and a traditional tea house. Of particular interest is the fixed-point turnout, which routes clockwise traffic straight through into the long spur (see video clip below). This, and other features, are explained and pictured on Yuta’s excellent website, Yuta Atelier. 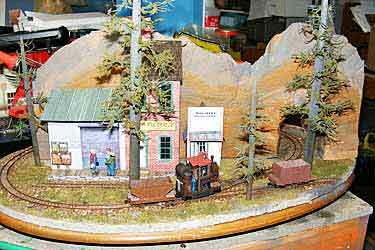 Ton de Vos, from Schiedam, set his HOe layout (1:87 on 9mm gauge) in Karelia, northwest Russia. 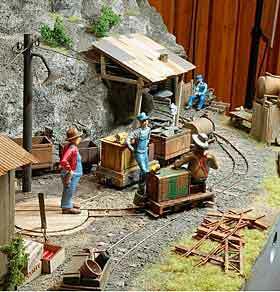 There are a number of nickel mines in that area, and the fictional Nikkel 3 railway serves a mine in the period of 1950 to 1980. 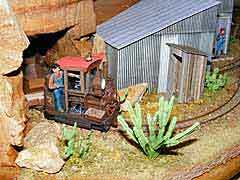 Nearly all the equipment and structures were scratchbuilt by Ton, and the landscaping was installed by well-known European modeler Henk Wust. Trackage combines an oval and a timesaver. 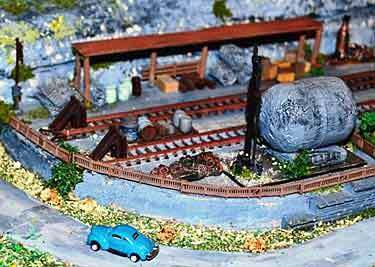 Ton explains, “The operation of the layout is very simple—there are 2 identical nickel ore trains, one loaded and one empty. They both run in a push/pull mode.” The empty train appears, stops before the loading facility, honks (or whistles, depending on era) and, as the doors open, disappears into the facility. Meantime, a railcar visits the station, and a rubber-tired bus (or other vehicle) descends the hill to the station, propelled by a magnet attached to an endless chain under the roadway. The facility doors open again, and a loaded train appears, stops at the station, and proceeds on its way. This scenario is repeated several times a day at exhibitions. 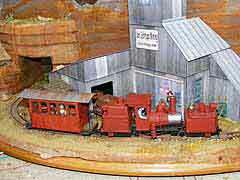 Ton has scratchbuilt most of his rolling stock, including trains from the 1950s to the 1980s. 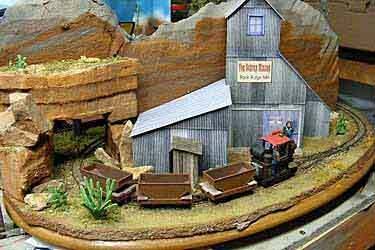 For more information about this scenic layout, look here. Each year KiwiRail, the company in charge of the New Zealand railway business, sponsors a “Take a Train to Work Day” for employees at its headquarters in Wellington Station. This year’s event fell on 19 November, and two readers and contributors to this site were declared the winners of the competition. 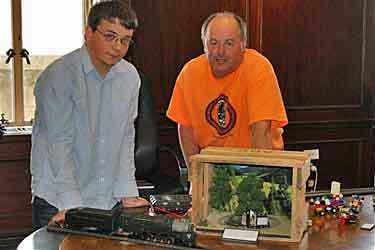 Gavin Sowry (at right) won the award for the “most artistic” display—a circular track running inside a beer crate, running around trees and called Pizza ‘n Beer. 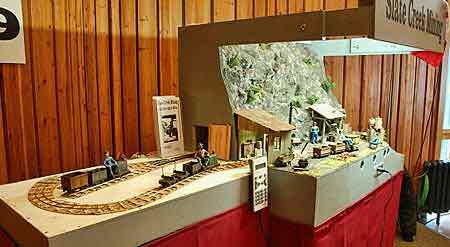 Award for the “most realistic” display went to Ben Calcott, who brought an O-scale three-rail model of a Pennsylvania Railroad 6-8-6 S-2 turbine steam engine that impressed the judges by belching smoke. Congratulations to both men, and keep up the good publicity work! “Shortliner” Jack Trollope, from the northern Highlands, loves to improve on published plans. This one, The Bronx Facility, started as one of Carl Arendt’s designs. Jack added more Peco Setrack, creating a very good version of a New York City car-ferry yard on the Harlem River, much like the ones shown here. Note: this design does not model a specific yard, but convincingly suggests several of them. 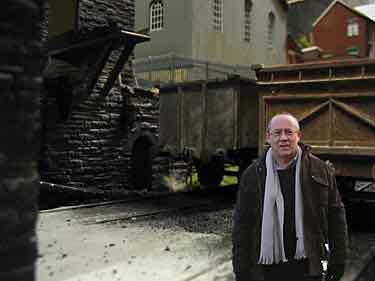 Jack’s own Harlem Station recreates the Erie’s prototype yard. Cavorite is a mineral invented by H.G. Wells and is explained here (see “A Layout From Micro History”). Russ has assembled a Picasa album of photos of this tiny line, including two videos showing its operations (the videos are numbers 4 and 12). The video at Photo 12 shows Russ’s On18 Garratt loco (lower left) actually turning the corners of this condensed railway. 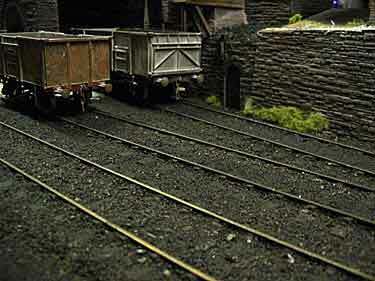 Inspired by Colin Peake’s OO Layout in a Box File, Randall Morris, from Swansea, has built Maenol Mine, an O scale (1:43.5 on 1¼in track) coal mining line. “Maenol” (pron. MY-nawl in Welsh) means “manor,” the estate of a Lord, so the railway name is a bilingual pun. 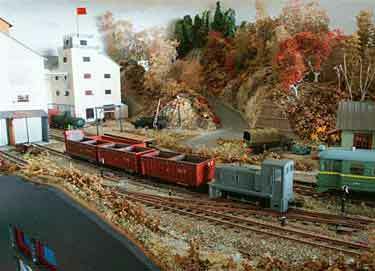 The visible section of Randy’s layout measures 48x16in (120x40cm). The plan is a basic 3-2-2 Inglenook pattern, and he has enhanced it with an impressive colliery loading shed that realistically fills the wagons. This procedure is illustrated in two YouTube videos, here. 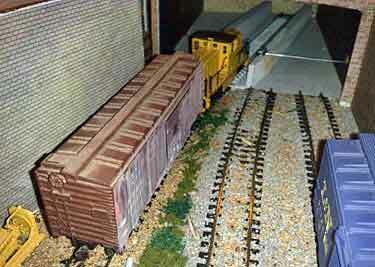 Operations consist of bringing in empty wagons from the fiddle yard and hauling away the loaded ones. 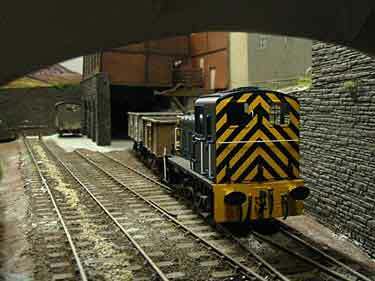 O scale allows careful attention to detail and atmosphere to create a highly realistic impression for a viewer. This layout is particularly satisfying in that regard. As a demonstration of its “reality” the photo at lower right shows Randy on a recent visit to the line for fact-finding purposes. There are more photos and lots of description on his RMWeb thread.